Arrowhead Coin & Jewelry has built a reputation as a top broker for gold, silver, jewelry and other precious metals. Arrowhead Coin & Jewelry has top ratings on Google, Yelp and the BBB. Owned and Operated by Jeff Wuller, Arrowhead Coin & Jewelry works directly with clients at their locations. Jeff Wuller has expertise in gold and silver bullion. If you need a gold broker to evaluate your gold and silver holdings, Jeff has the education and expertise to do so. He knows his coins, bars, and rounds. If you inherit gold, silver or other precious metals, and are interested in the worth, contact Jeff today. An independent appraiser can dedicate their time to you and you will have the benefit of undivided attention from an industry expert. Jeff Wuller knows his rare coins and jewelry, and can help determine the value of any collection. Jeff Wuller is an AZ local independent coin and jewelry appraisal. Jeff is a member of the American Numismatic Association (ANA) member # R-208942. He is an Authorized Numismatic Guaranty Corporation (NGC) dealer. He has been active with coin clubs in California & Arizona and members of many others, and is a former President of the Arizona Territorial Coin Club in Glendale, Arizona. He has given numerous presentations on Coin collecting, and US Patterns. Jeff has attended the ANA training on Advanced Coin Grading, and Counterfeit & Altered Coin Detection. Jeff is currently attending over 25 shows a year actively buying, selling and appraising US coins, US Currency & other collectibles. Precious metals investors need a dependable local broker to help with understanding and discussing market trends, advising and assisting with purchases and sales of gold coins, gold bars, silver coins, silver bars and other metals investments. An Arizona gold and silver broker can identify and properly evaluate the worth of precious metal, whether it be jewelry, coins or even bars of gold and silver. Jeff Wuller is a local broker that has the education, expertise, and reputation you would want when buying and selling precious metals in Arizona. Investors that are looking for a respected, trustworthy, and experienced gold and silver broker, contact Jeff today. for coins and coin collection. Arrowhead Coin & Jewelry offers services to those who want to invest, sell, or buy coins, currency, jewelry and collectibles. For your convenience, Jeff Wuller, the owner of Arrowhead Coin and Jewelry, will come to you to assist you in any way necessary. An expert in jewelry appraisal, determining the worth of antique jewels or rare gems, heirloom jewelry and even diamond appraisal. If you have gold or silver jewelry, coin collection, contact Arrowhead Coin & Jewelry. We pay cash for your gold or silver jewelry. It’s easy! Just make an appointment and we will give you an appraisal based on daily market prices. However, for your convenience you may also use our safe and easy mail-in process. Our commitment to our clients does not stop there. In addition to buying and selling precious metals and jewelry we can also represent you in selling your items at a fair price for you!. Can we assist you in finding a rare or special coin? Searching for that elusive numismatic treasure? Looking to invest with bullions or bullion coins? Contact Jeff today, at Arrowhead Coin and Jewelry, with your request and we will do our best to fulfill your wishes. We will use our extensive experience and connections in the industry to help you find that special item! Jeff is one of the most experienced and knowledgeable investors in precious metals, coins, and jewels. He has over 25 years of experience and is rated A+ by the BBB. Jeff Wuller can be accountable and be trusted. As a coin and metal investor in Phoenix, you need the best gold broker near you. Jeff Wuller is your best gold broker in Phx. He wants the best for his clients and know his coins, bars, jewelry, and collectables. Gold Eagles are great gold coins for investors. Contact Jeff today to learn where you can buy or sell Gold Eagles in Scottsdale, AZ. Gold coins, jewerly, and bullion are a great way to invest in gold. Contact Jeff today, your local Surprise gold trader, and learn why. Looking to buy gold bars, eagles or other precious metals from a broker in Sun City? Jeff Wuller is a private gold dealer in AZ and can assist you. Jeff Wuller is a local gold dealer in Peoria. He has over 25 years of experience dealing with gold and silver bullion. Interested in investing or selling gold in Glendale, AZ? 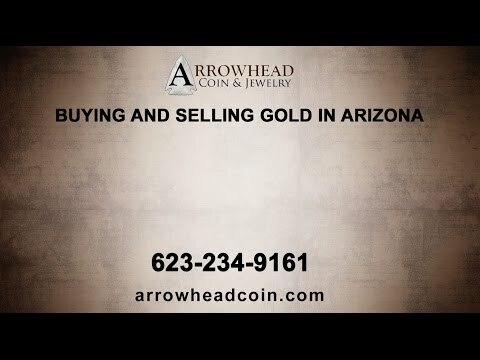 Contact Jeff today, from Arrowhead Coin & Jewelry.